BINTANGNEWS.com – At least seven Palestinians have lost their lives and over five hundred more sustained injuries when Israeli military forces opened fire on a group of protesters participating in anti-occupation rallies along the border between the besieged Gaza Strip and Israeli-occupied territories. 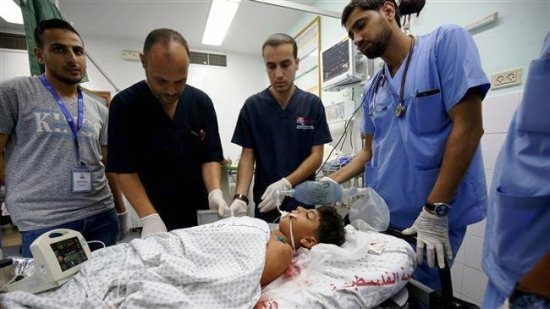 The Gaza Ministry of Health said in a statement that 14-year-old Mohammed Nayef al-Houm was fatally shot in the chest during “The Great March of Return” protests east of Bureij refugee camp on Friday evening. The statement added that 18-year-old Iyad Khalil Ahmed al-Shaer and Mohammed Bassam Shakhseh, 24, were shot dead east of Gaza City. Three others were later identified as 24-year-old Mohamed Waleed Haniyeh, Nasser Azmi Musbah, 12, and 18-year-old Mohammed Ali Anshasi. The other slain Palestinian remains unidentified as of yet. Another 506 protesters were also injured. A total of 210 demonstrators were admitted to hospitals and medical centers across Gaza Strip to receive medical treatment. Ninety people were struck with live bullets. Thirty-five children, four women, four medics and two journalists were among the injured Palestinians. A minor and a young man were taken to hospital in critical condition. Both had suffered Israeli-inflicted gunshot wounds in the chest. More than 190 Palestinians have been killed by Israeli forces ever since anti-occupation protest rallies began in the Gaza Strip on March 30. Approximately 20,000 Palestinians have also sustained injuries.